"I am purdy, but I don't know it!" "I'm going to the barn for a drink & a nibble of hay. Anybody else coming?" 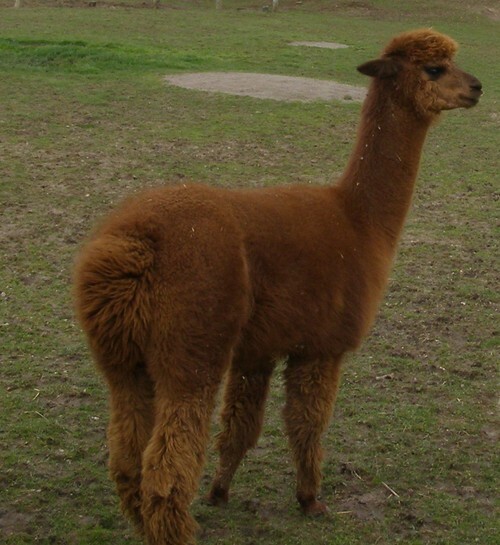 This Accoyo Pluro grandson has put some spectacular crias on the ground ever since, in practically all colors from beige to bay black (no whites). Hannah's Grace was my first alpaca to get to the farm. Her barn name is "Hannah-Banana", for no other reason than that it rhymes, but Hannah for short. Good posture and moderate size. Straight legs. She is DRG, vicuna pattern of fiber growth areas. Everyone remarks about the length of her long camelid eyelashes. Hannah does need lower front dental services with the Tooth-a-matic occasionally. Hannah is very shy, wouldn't ever consider hand fed snacks, though she will ask to have her belly sprayed with the water hose in the summer to cool off. She would never think of barging in or challenging the "piggies" at grain feeding time. If she is at the trough first, then she may offer a soft half hearted saliva spit at her peers to get in at least another nibble or 2. Her fleece is glossy with a mild crimp. Her maternal grandparents were Full Bolivian imported suris. In the sunshine occasionally one can see a pink-maroon hue. Blended with Merino or Debouillet, her fiber produces a glistening yarn. Good posture and is of moderate size. Initially breeding attempts seemed uncomfortable for her. 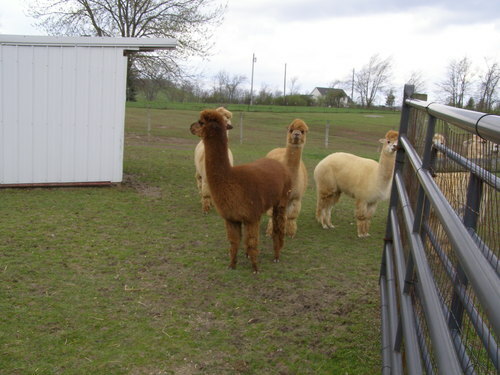 Camelid specialist, Dr. Marty Masterson, DVM stretched her hymen. Shortly thereafter she apparently conceived in a 3-5 minute breeding at most and she had a surprise birth 11.5 months later. Maybe her new nickname should be "Fertile Myrtle". A great natural mother. 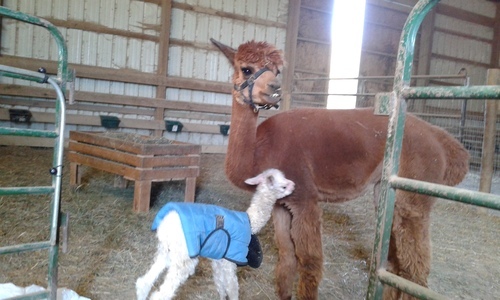 She has a White male cria at her side. He thus far has an impressive longer stapled huacaya crimpy-curly fleece. He has the same gentle demeanor of both his parents. 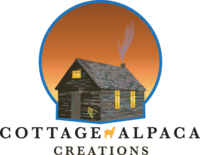 The cria's name is Baffin of Cottage Alpaca Creations. His sire is Champion's Protegé who is also white and despite his age of 11, has maintained softness and has impressive EPD's.